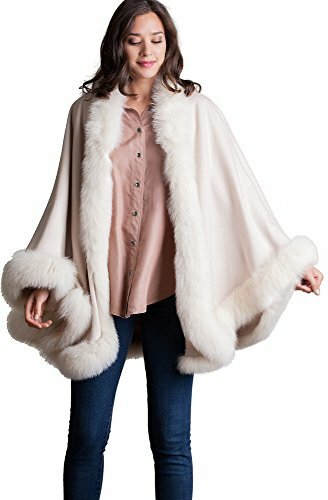 Our soft 100% cashmere cape is all about warmth, glamour, and oodles of fluffy fox fur. Slip on the Jodie for special evenings out-and with everyday skinny jeans and heels, this cape rocks. One fur hook secures the neckline, and a button on each side creates the sleeve for a more defined shape. Whichever way you wear it, you're warm and well dressed. 100% cashmere. One size. Weight: 1.6 lbs. 31" long. Made in China. One size. Weight: 1.6 lbs. 31" long. Made in China.